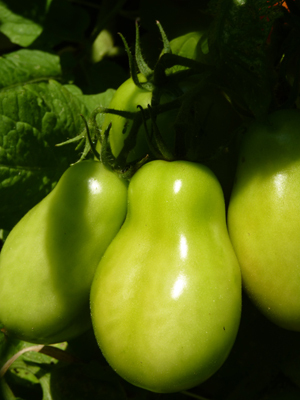 Paste tomatoes, with their lush shape. Brandywines, heaviest, pinkest, and sassiest of them all. Modest Moskvich, least likely to drape itself over the borders of sandwich bread. Endless lines of cherry tomatoes. Will that march ever end?! 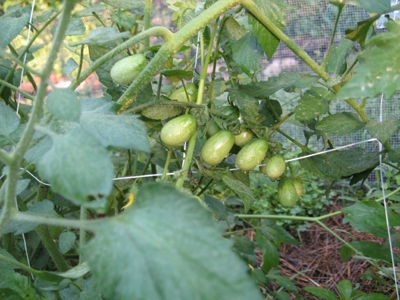 And so I searched the internet for advice on ripening these tomatoes if frost threatens. I will not waste one of them, and already have a new package of brown lunch bags close at hand. My children no longer need my carefully packed, clever, delicious lunches. The tomatoes do need me, and I will tend to them with love. — do a serious pruning of all branches that are not bearing fruit. 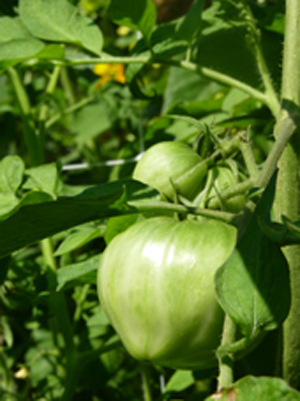 It seems to allow air to flow around plants and sunlight to get to the green fruit. — There are a couple natural things that hasten ripening: withholding water, and darkness. 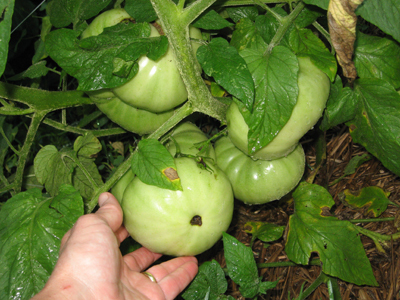 — picking the tomatoes at first sign of blush (pink) is the way to go, to avoid pest damage and late season diseases. — leave yours in the garden, until frost is expected. — put pink romas in a paper bag for a few days. — Bring them indoors, wrap them in old clean socks, hide them in a drawer. — Deprive them of water. — just wash them, dry them, freeze them whole with the skins on. Then, when they are thawed out, the skins come off easily. — We always just picked them green the day before the first frost and put them in a paper bag on the counter. It works.